What with shows like the X Factor and Glee ruling our screens, we have never being so keen to show off our musical talents. If you see yourself as more of a band member rather that the singer, the Paper Jamz rang from iwantoneofthose.com could be the perfect way to unleash your inner rock god. We looked at the Paper Jamz a couple of months back – check the video evidence below – but now there’s a Drum Kit, Amp and Guitar Strap to complement the original guitar and amp. In case you missed it first time round the Paper Jamz guitar has a wide range of playlists to suit any musical taste. You can opt to play the guitar freestyle or play along with a built-in song of your choice. You can even play major, minor and seventh chords. Thanks to the touch sensitive technology, you can get the right sound minus the finger pain as all you have to do is lightly touch the frets at the desired location and stroke your right hand across the ‘strings’ to play them. If keeping the beat is more your thing, the Paper Jamz Drums comprises of five drums that allow you to play over classic built-in songs, or join in with your guitar playing band mate for a freestyle jam. 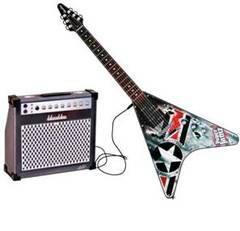 The Paper Jamz Guitar and Paper Jamz Drum kit are priced at £24.99 each and available from here. Do men and women use Twitter in different ways? I went and bought the paper jamz guitar. But I don’t see any way to play seventh chords. help!